Jennifer Sims, who recently became a U.S. Equestrian Ambassador for the USEF, is wearing Litex For Riders Swarovski crystallized show shirt and matching Litex For Riders show jacket, Madewell black skinny jeans and heels by BCBG. Equestrian fashion influencer Jennifer Sims — known in the Instagram world as @styledequestrian — bought her first horse with money earned modeling Levis. In addition to her Instagram presence, the former DJ and mother of a budding horse girl is a model for numerous equestrian brands. Along with her horse, Rocket, they showcase the latest trends from life at the barn to life in the show ring. 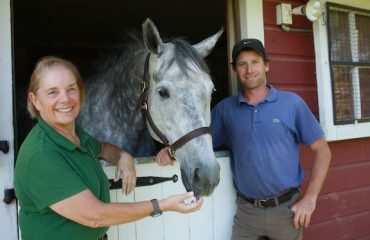 A Los Angeles resident, Jennifer will be making her stunt double debut this year in the upcoming Katherine Heigl movie “Unforgettable.” She is also teaming up with the United States Equestrian Federation as a U.S. Equestrian Ambassador where she will promote fashion on social media and in print. 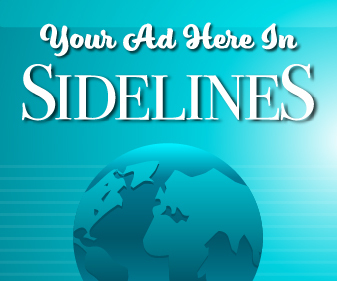 Jennifer met with Sidelines’ writer Susan Friedland-Smith during the Las Vegas National Horse Show and shared her story. Jennifer in an EQUO champagne and horses pullover, Voe blue bomber jacket and Voe Rein Clutch, Madewell boyfriend jean, Treasurie Jewelry necklace, Caracol Silver bangles and Adidas sneakers. Congratulations on being a US Equestrian Ambassador. What is your role as an ambassador? How will people connect with you as an ambassador? You’re obviously really into fashion. When you started the @styledequestrian Instagram account, were you thinking it’d really take off or was it just for fun? I started doing my @styledequestrian Instagram for fun. I didn’t expect it to be as big as it’s become. I thought it might be fun if I got a cute T-shirt here and there. I didn’t really have high expectations, but I enjoyed the clothes and putting together the outfits, and I ride every day anyway, so why not? Then I started getting a lot of positive feedback and followers, so I thought, “I think I’ve kind of tapped into something here. This is really fun!” With my background in modeling, I have some connections with photographers, so I asked them to take a couple of professional pictures for me in addition to the selfies on my horse. I think that’s what helped push it to the next level and draw in some of the bigger brands to want to work with me and want to see me in their breeches or show jackets. What are some of the brands you work with? I saw you on the cover of the fall Romph catalog. Yes, Romph, Alessandro Albanese (AA Equestrian), Asmar Equestrian and several others. Jennifer wearing a For Horses lace show shirt under Calvin Klein leather motorcycle jacket, Madewell black skinny jeans and dark green suede boots by Boden. Do you have a lot of closets at your house? I’ve taken over my husband’s closet. Luckily he’s not very materialistic, so he only needs a tiny section. How did you get cast as a riding stunt double for Katherine Heigl’s upcoming movie? Warner Brothers came to our barn to use it as a location and they asked the owner if he had any tall, blond, good jumper riders who might be interested in riding as a stunt double. He called me to ask if I’d be interested. They introduced me to the crew while they were scouting out the location and they said, “Perfect! You’re the exact same height as Katherine Heigl.” At that time, my hair was blond. They only thing they had to do was stuff my bra — that was a whole thing in and of itself which was funny. I explained to them that I do an equestrian fashion Instagram, and told them if they needed any tips on dressing Katherine and myself for the riding scenes, I’d like to help out because I knew that their fashion stylist didn’t know much about the equestrian world. So that was fun, too. Does Katherine ride in real life? She rides dressage and has a few horses. Katherine actually came and took a lesson on my horse, Rocket, to walk, trot and canter a little bit to make sure that she was comfortable on him and that he was okay with her. Then, for the actual filming, she rode around at the walk, trot and canter and then I got on and did more riding and jumped a course of fences as her double. “Unforgettable” kind of has a “Fatal Attraction” theme. Katherine’s the ex-wife, and she and the new wife don’t get along. There’s drama between them and she’s supposed to be conniving and maybe a little bit evil, which is so out of character for Katherine because she always plays these romantic comedy girls. So it was kind of neat to see her in that character. Her character and her character’s daughter ride as well, and that’s how the equestrian scenes come in. Jennifer adds a Manor Tote by Tucker Tweed before heading out. In addition to being involved in the acting world as a stunt double, you used to be involved in the music industry as a DJ for night clubs. How did you get into that? I’ve always really been into music and I’ve been collecting vinyl since I was about 14, so I have a pretty extensive vinyl collection. When I moved to California from New Jersey, I had a couple of friends who were deejays and they knew I was really into my records. One said, “Why don’t you come out when I’m spinning and you can bring a box of records and hop on the turntables and start spinning.” I said, “I don’t know how to deejay and I have only one turntable.” At that time there weren’t really any girl deejays, especially one who was modeling, so it was really easy for me to book gigs. Did you have a DJ name? DJ Gelfling, from the Dark Crystal. Totally nerdy, but that’s me. I’m kind of all over the place; it depends on my mood. I really love punk rock, classic rock, metal — I also love old hip hop. Tell us about your husband. Your daughter Hannah shows and has a pony. Did you brainwash her into becoming a horse person? She comes from a long line of horsewomen. I’m a horsewoman, my mother-in-law is, my sister-in-law is, and I think it’s just in her blood. And when I was pregnant with her, I’d gotten a horse and come to the barn I’m riding at now — San Pascual — and so she’s been born and raised at the barn and has always been around the horses. She thinks everybody has horses; that this is everybody’s lifestyle. She started riding and taking lessons when she was about 5 or 6, but she wasn’t that into it. Then when she was about 8, she said, “Okay, I want to start lessons again,” and so she started out with one lesson a week and then after six months she said, “I want to ride every day.” So she started riding the school ponies, and then we half-leased a pony for her, and then about a year ago we bought her a pony. Do you go to shows together? We’ve done a couple of shows together, which was too stressful for me and I don’t get to enjoy and support her as a mom because I was running off trying to learn my course as well as make sure she knows hers, so we’ve been alternating shows. I did this show (Las Vegas International) and I did Del Mar, but before that she did Thermal and the Los Angeles Equestrian Center. So we just go back and forth for now. I don’t know how long it’s going to last. If she’s going to want to start showing all the time, it might be time for me to pass the torch and retire. I train with David Sterckx and right now I’m competing in the meters and 1.10s, and eventually I’d like to move up to the meter-20s and maybe even -30s. Not in the next month or two — I’m not there yet — but that’s my long-term goal. I’m not necessarily looking to become a grand prix rider because to do that you’ve got to be able to compete two and three times a month minimum, and I just can’t do that. I can’t leave my daughter and my husband for that amount of time. 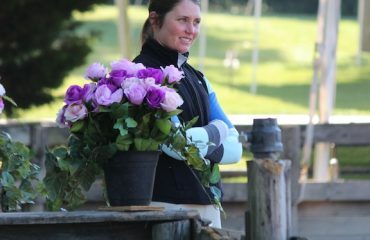 So when you’re riding or just schooling, do you have a favorite outfit you like to wear? Like the music, it depends on my mood. 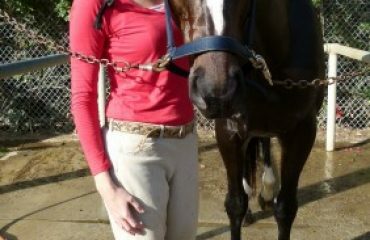 When I come back from a horse show because I’ve been dressed up every day, I don’t want to dress up again, I don’t want to tuck my shirt into breeches, I don’t want to wear a belt. I’ll just wear riding tights, which have become really big right now — all the riding leggings that are like LuLulemon riding pants — and I wear those with a comfy T-shirt or sweatshirt, just go very casual. But then, when I go back into the lessons with my trainer, I’ll put on my Tailored Sportsman breeches and wear a nice polo shirt or show shirt to look a bit more professional and less casual. 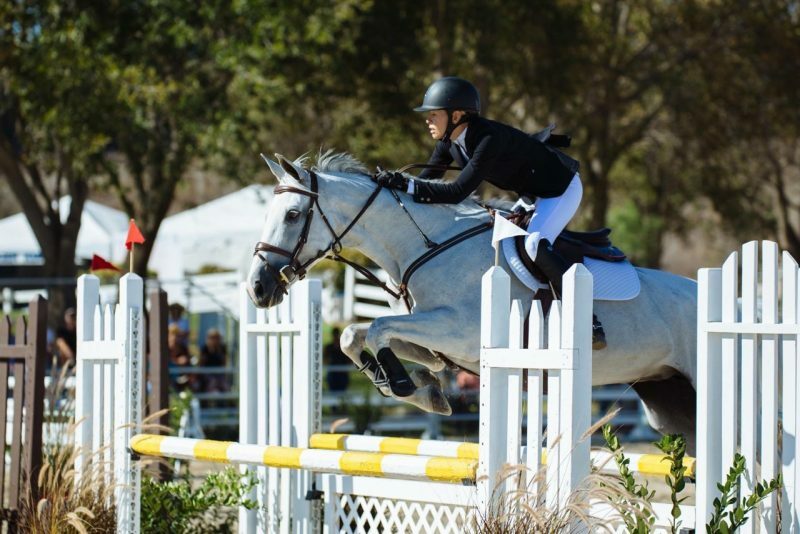 About the writer: Susan Friedland-Smith of North Tustin, California is a middle-school teacher and equestrian lifestyle blogger at Saddle Seeks Horse. Check out her blog saddleseekshorse.com and follow on Instagram @SaddleSeeksHorse.